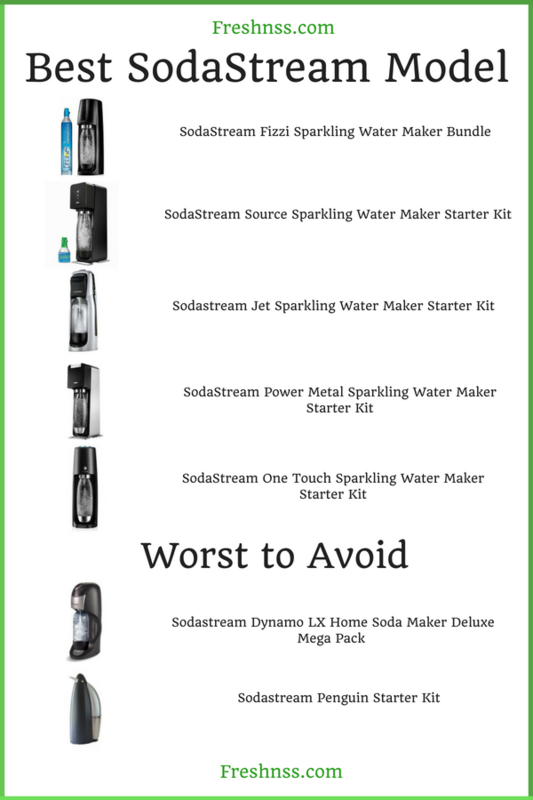 In 2019, it’s become a popular option to select the best SodaStream model in order to craft sparkling waters, seltzers, sodas, or bubbly cocktails at home, as well as to cut back on the amount of packaging waste from store-bought drinks. Home soda machines have been on the market for some time now, featuring both sparkling water makers and soda siphons designed for dispensing carbonated water in order to mix into a fizzy beverage (or three). Over the years there have been several iterations of SodaStream models and it can be quite a task to sort through all the options to find the right fit for your home or office needs. We’ve researched and determined the eight top-rated SodaStream models, as well as four unavailable models that are rare to find on the market, which you may want to avoid. Which SodaStream model fits your needs? Bonus: don’t forget about a warranty! The SodaStream Fizzi is one of the best SodaStream models on the market, primarily if you buy it as a complete bundle. This is because of the components, which includes: two 60 liter CO2 carbonators, three 1 liter carbonating bottles and two Fruit Drops 40 ml flavor syrups. The 60 liter carbonators are only available as an add-on with a rebate in the kits of the Jet, Power, Source and Crystal models, or can be purchased individually. This aspect alone delivers an upfront value to the bundle that is unmatched by most of the other SodaStream kit options. The total cost of the bundle is also less than some of the other leading SodaStream kit options and the Fizzi gives you more of what you really need. More CO2 for carbonating water and more carbonating bottles to do it with, plus the flavors to get creative when you’re crafting your sparkling water or soda beverage. The sparkling water maker itself is easy to use and pleasing to look at as a countertop appliance. In fact, because it is lightweight and doesn’t require any batteries or outlets, it’s environmentally friendly, and can travel with you, if you choose to take it on the go. What’s more – this version of the SodaStream has improved upon the ‘buzz’ sound, which is present with the Jet and Crystal versions. The Fizzi offers more of a ‘puff’ sound, when carbonating the water. This might not seem like much of a difference, but when in a SodaStream comparison side-by-side, it’s clear that the Fizzi produces a more desirable sound-effect. Push down on the ‘fizz button’ and you’ll get as little or as much carbonation in your sparkling water, as you wish. It doesn’t get any more straightforward, yet appealing in terms of ease of use and aesthetics. This is a top of the line SodaStream option in 2019. Source is a super popular model that’s been a mainstay of SodaStream’s offerings. If you’re just getting into making carbonated drinks at home, or on the go, the starter kit the way to go. It includes the Source Sparkling Water Maker machine, which is lightweight and portable enough to pack with you on a vacation or even a camping trip, as it does not require electricity or even batteries to power it. The SodaStream Source also is one of the only models with a LED indicator, which monitors how much carbonation is produced with each manual pump. This turns out to be a helpful feature. If you choose this model, this video will guide you through how to use your SodaStream Source Sparkling Water Maker. Additionally, the Source kit includes: a 1 liter carbonating bottle, plus a CO2 carbonator, which will make up to 9 liters of sparkling water. It’s compatible with the 60 liter carbonator and there is an additional mail in rebate for this, as well. The Jet is a basic, yet wildly popular SodaStream model. It’s simple design makes it cost-effective and a good entry level machine for first-time soda maker buyers. The SodaStream Jet is compact and lightweight, which gives you the versatility to set it up on the countertop, or take with you on the go. Setting up the Jet is straightforward enough, but does require a bit more technique than some of the other models. Specifically, it is missing an auto locking feature for the carbonating bottle, which most newer options have. This video provides a simple tutorial showing you how to use the SodaStream Jet and set it up without creating much of a mess. Once it’s set up, in order to create sparkling water, all that’s required is manually pressing a single button to your desired carbonation level. The ‘buzz’ sound – which is somewhat outdated since the creation of newer SodaStreams that produce a ‘puff’ sound – is similar to the Crystal model and will let you know that it’s working. And because it is effectively a manual operated sparkling water maker, it does not require electricity or batteries, which means it’s an eco-friendly choice, compared to the electricity supplied SodaStream Power, for example. The full kit comes with the same useful components as most of the other top options, as it includes: the maker, a mini CO2 carbonator, a reusable 1 liter carbonating bottle, as well as a rebate for the larger 60 liter co2 carbonator. Please note: there was a SodaStream Fountain Jet, once on the market, which is unavailable in 2019. This sleek stainless steel model is a top choice for those who are interested in the convenience of an automated soda maker to set up at home or in an office kitchen space. It requires an electrical outlet, like the One Touch and Revolution, to automatically generate the desired carbonation level, but this also makes it easier to use. Simply press one of three LED buttons that determine the desired carbonation level. Once the carbonation process stops, the LED also stops blinking to notify you that your sparkling water is ready. You’re able to carbonate a one liter bottle up to two more times without removing the carbonating bottle. After that you’re ready to add the flavor to the sparkling water – either directly to the carbonating bottle or in a separate container. Give it a slight shake or swirl and your drink is good to go! This video gives a helpful tutorial on how to use the SodaStream Power. The SodaStream Power Metal Sparkling Water Maker Starter Kit comes with the same equipment as most of the other popular models, except it comes with a carbonating bottle that has a slick looking metal accent. The One Touch by SodaStream is one of the newer models in 2019 and represents the convergence of convenience with aesthetic appeal in this automatic sparkling water maker. Gently touch one of three carbonation options and your water will turn into sparkling water in no time. Unlike some of the more ‘eco-friendly’ versions on the market, such as the Fizzi, Crystal, Play, Source or Jet, the One Touch is conveniently electric powered. Yet the carbonating bottle is stainless steel and reusable, which means fewer bottles overall, end up in the recycling bin. The CO2 carbonator load process is a breeze as well. The snap-bottle lock process of producing carbonated water quickly, is also very straightforward. All in all, this is an option worth exploring. The SodaStream Crystal model is an excellent option due to its eco-friendly nature, as well as its ability to produce quality carbonated water. This manual pump machine requires no electricity or batteries. It features an easy-to-press carbonation button, instead of a cumbersome lever. It will make a ‘buzz’ sound to indicate the carbonation level you’re producing to make sparkling water, soda, or even an energy drink (depending upon which flavor mixes are added after the carbonated water is produced). This video is very helpful to show you how to set up your Crystal. A great feature included in the Crystal starter kit, in addition to the standard mini CO2 carbonator, is the glass carafe to mix and serve. The carafe – which can also be purchased separately – is easy to clean, dishwasher safe and environmentally friendly, compared to plastic bottle alternatives. The SodaStream Play Soda Maker Starter Kit comes with the soda maker in several playful color options, so you can pick something to complement your kitchen, making it both functional and stylish. The Play works compatible with both 60 liters and 130 liter CO2 cylinders, which is not the case with all other SodaStream models. A carbonator is included in the kit. Additionally, it features several sample flavors, which is an aspect of the kit that most other models don’t offer. This is a convenient benefit, because you’ll likely be thrilled to start sampling different fizzy beverage creations, but without the SodaStream flavors, or SodaStream flavor alternatives, you’ll end up with basic carbonated water. The setup is easy enough, yet one point of differentiation is that the carbonator is loaded at the base, with the machine on it’s back. Most of the other SodaStream options remain upright while the carbonator is loaded from the upright position. The manual pump action is similar to other popular, ‘no electricity or battery required’ options. This video provides simple guidance on how to use the SodaStream Play. The SodaStream Revolution bottoms out our rankings of SodaStream models. From it’s looks alone, it stands apart from the other, more sleek and simple looking soda makers. This machine looks like a fountain soft drink maker you’d see at a fast food restaurant. That’s not to say that it’s unsightly, at all. In fact, the nickel accents against the black casing fits in nicely amongst most modern kitchen appliances. The full kit includes many of the components that are found in other SodaStream kits: a reusable carbonating bottle, as well as a 60 liter refillable carbonator. This is a perk, since many of the kits only come with a rebate for the 60 liter carbonator. The set up is also quite a bit easier than some models, such as the Jet for instance. You won’t need to screw the carbonating bottle in place, just simply push it into place. Once that’s in, all you need to do is press a button, you don’t have to pump or do any manual work to produce your carbonated water. Simply press a button and it will automatically fill the bottle to the desired carbonation level. On the downside, the additional convenience does add up to a higher price point and, unfortunately, possible issues with those moving parts. It’s also much harder to find in stock, these days. All in all, though, this is a higher end model for a reason. This was a durable, eco-friendly system that was designed to look sleek and last a lifetime. With the carbonator included in this kit, you could carbonate over 130 liters of sparkling water! There are few soda makers on the market that can match that output. It’s also helpful to be able to control how much carbonation you put into your drinks and with this model’s push activation, you only needed to pump one button in order to do that. To round out this mega pack, it also included two 1 liter carbonating bottles, which is definitely a bonus feature, compared to most starter kits. To top it off, you would receive a dozen flavor samplers, which is literally a sweet deal! Although this is in the ‘avoid’ category, it’s more so just because it’s a model that is hard to find and no longer a priority to SodaStream brand. If you’re able to find the SodaStream Dynamo on the market, at all, it’s may be a great value – which seems like a rarity these days. The Penguin by SodaStream is a unique looking soda maker that is harder to find on the market today. And yet, it’s also a practical and eco-friendly sparkling water solution. This video demonstrates that it’s rather easy to set up and get started. Utilizing a manual pump, by pushing down on the lever piece (which resembles a penguin’s beak), you’re able to generate the carbonation to the level you wish. This means it operates without batteries or electricity. Additionally included in the kit, similar to the Crystal, is a glass carafe. This is more environmentally friendly than the plastic version, and is also dishwasher safe. With these perks, the downsides are that it is a bit clunkier than some of the other SodaStream options and the sounds it produces as it’s carbonating is one you’ll either enjoy or be annoyed by. The SodaStream Genesis, also known as SodaStream Red, is an older model that was a popular version in its day. As with many of the current SodaStream options, this one came available in a kit, which featured some value-adds that are not as common in more modern kits. For example, it came standard with a 60 liter carbonator, as compared to the rebate for the after market purchase of one, which is the norm in 2019. This of course means you won’t have to run to Walmart or Target to fill it up as often. It was an eco-friendly model that didn’t require battery power or electricity to operate, instead utilizing a manual push to determine the level of carbonation in the water. What’s more, when you screw the bottle in and activate the carbonation, the system was not known to move or shake, making it smooth and quiet to operate. The carbonating bottles were built to last up to three years and featured hermetically sealed caps, which means fizzy drinks stayed sparkling for longer. One negative aspect of this model is that you would have to screw in the carbonator manually, without tools, although this left gaps for gas to escape, resulting in an overall more fizzily beverage. The SodaStream Pure was a sleek looking, yet practical sparkling water maker model. The full kit came with a brushed stainless steel machine, along with a 60 liter carbonator, and a BPA free carbonating bottle. It was portable enough to carry on the go, as it required no batteries or electrical outlets to power. Simply pump the top to the desired carbonation level and your water will quickly become fizzy. Though it’s difficult to find this on the market in 2019 anyway, it is one SodaStream model to avoid because it’s been known to make a loud ‘burp’ sound when reaching the max level of carbonation output. It has also got a reputation of overflowing carbonated water if it is unscrewed too quickly after being pumped. All in all, you can find much better options with the modern SodaStream options around. How often do you browse the beverage aisle wishing there was a more unique sparkling water flavor or carbonated beverage to suit your individual taste buds? Each of the popular SodaStream models are fantastic for crafting your own flavors of fizzy drinks, at a reduced cost. You can use yours to create cola, sparkling fruit juices, seltzer water, cocktails and even energy drinks, when you mix in your favorite SodaStream syrup or SodaStream syrup alternative. Before you can get into customizing your drink, you first need to settle on the right SodaStream model to bring into your home or office space. In order to do that, it’s important to be aware of the different types of SodaStream models, as well as to note the differences between each type of home based beverage dispensing machine, which includes soda makers (and SodaStream alternatives), sparkling water makers and soda siphons. Soda makers focus on creating soda and soft drinks at home, as the name would indicate. SodaStream was one of the first manufacturers to market these types of appliances. At this point in time, there are several SodaStream alternatives designed to offer options. Soda maker appliances are akin to a countertop appliance than a ‘to-go’ product. The key indicator of soda makers is that they are appliances that are either plugged into a wall socket or pumped manually. From there, carbon dioxide is added to the water from a pressurized cylinder, or carbonator, built in to the machine, typically releasing into carbonating bottles, 0.5 or 1 liter at a time. This ultimately creates carbonated, or sparkling water, which then becomes flavored to taste using branded SodaStream flavors. Popularly, these are soda flavors that mirror popular cola or lemon lime brands. Sparkling water makers effectively work in the same way. One of the key differences is in the way these machines are marketed to cater to the growing demand for healthier beverage options. More and more people and families and workplaces are hosting healthier drinks, in place of soft drinks. Sodas have also become less popular over the years for the same reasons. Folks have become more aware of the empty calories and adverse effects of sweeteners like high fructose corn syrups. However, it’s simply too desirable to trade off the fizzy taste profile of a soft drink. This, again, is why sparkling water makers have become a sought after appliance. And it may be a key reason why nearly all of the SodaStream models on the market are labeled as a ‘Sparkling Water Maker’. Soda siphons, or siphon seltzer bottles, are another popular choice in terms of carbonated home based beverage dispensers. These types are a more popular option for mixed drinks or cocktails in a bar setting, but can also be used at home bar or for regular use in creating seltzer style or sparkling water beverages that are free of alcohol. The siphon is designed to maintain carbonation within the bottle, while dispensing a fizzy drink using CO2 chargers. Siphons also have fewer parts and are more lightweight and portable where as a soda maker appliance uses a carbon dioxide container that is placed inside the machine to carbonate the water. The siphons use replaceable CO2 cartridges on a piece that is attached to the bottle. While most manufacturers of soda makers do produce CO2 refills, you have to make sure to get one that is compatible with the brand you choose. Soda siphons are usually perceived as slightly more cost-effective upfront than soda makers such a SodaStream. However, they often will not come ready to produce as many fizzy beverages as traditional soda makers for as long. As you can see, there are several different kinds of soda makers and machines on the market, each designed with a slightly different purpose in mind. Most all of the popular SodaStream models fall under the category of soda machines and sparkling water makers. Now that you have more insight into the types of home based dispensing machines, it’s time to key in on your favorite model from the top-rated brand on the market, which of course is SodaStream. So if you’re ready to become an environmental warrior (SodaStream runs recycling programs and uses recyclable products), get healthier (there’s less sugar in SodaStream mixes than store-bought fizzy drinks), and introduce your family or your office kitchen to a practically infinite amount of fizzy flavor combinations, a home beverage model from SodaStream may just provide the solution you’re looking for. Over the years, SodaStream has introduced several models to the market. And with PepsiCo’s acquisition of SodaStream for $3.2 billion dollars in August 2018, there’s increased attention on home-based beverage dispensing systems. After some time, each of these sparkling water makers has either been a big hit or is currently unavailable for various reasons. After extensive research on the chronology of their product line, the data is still a bit diluted. The main thread of commonality between each option is that they all have received predominantly positive feedback from fans and critics alike. Each of the main models can be used along with the branded SodaStream CO2 carbonator and SodaStream 1 liter or 0.5 liter carbonating bottles or SodaStream Glass Carafe. Often these can be purchased together as a starter kit, or individually in parts or as refills. This is a question that came up repeatedly during our research. Providing an answer is beneficial, since it seems that most SodaStream models are labeled as not requiring electricity or batteries to operate and this perplexes many people. So does SodaStream use electricity, or batteries; and if not, how does it work without these power supplies? Some models, such as the SodaStream One Touch or Power, do use a plug to power up. This make the process automated and convenient. However, almost all other SodaStream options require a manual pump action, pressing a button repeatedly or pushing against a level of sorts. To most people, this is super easy to do and not an issue at all. However, many people opt for convenience and electric powered appliances, even if they are slightly more expensive or less environmentally friendly. In-Stock vs Unavailable: This is one of the key factors when considering which SodaStream to buy, simply because when you begin researching, you’ll find nearly a dozen options of active and also unavailable models. It’s imperative to distinguish which of them are currently available on the market and which are essentially discontinued or hard to find. If you’re just starting out with your first purchase of a soda maker or sparkling water maker, it’s advisable to aim for a more recent model so that the parts and add ons are readily available. Manual vs Automatic: Most SodaStream options are labeled as eco-friendly. One main reason for this is because the majority of their sparkling water makers are carbonated through a manual pumping process. Some are one finger, whereas others require a bit more force. Compare this to options like the Power and One Touch, which rely on electricity to run the appliance. It really comes down to your level of convenience. But it’s important to know what you’re getting with whichever option you choose. It would be disappointing to expect a soda maker that works at the click of a button, but actually requires you to manually push for the carbonation. Starter Kit Components: Nearly every sparkling water maker by SodaStream comes with an option to buy an entire starter kit. This is usually an excellent value when compared to having to buy each component separately. However, pay attention to what each kit offers. Specifically, if you opt for an older version of one of the SodaStreams, it seems the kit typically included a larger volume carbonator and sometime even sample flavor packs. It really depends from one to the next. Price Point: The price point and range of prices in the SodaStream lineup is typically within the $50-$300. The price points between the kits is actually quite close; typically within $50 or so. If you end up buying just the sparkling water maker, without the starter kit, you likely won’t end up with the carbonator, and sometimes not a carbonating bottle either. It might be the best option for you to purchase just the appliance, if you’re looking for an upgrade from an older model and already have the necessary SodaStream components in order to make a new one work straight away. If you’re just starting out, however, the starter kit really does offer the best value as an entry level home based beverage dispensing system. If available, a beneficial option to consider is a warranty for whichever of the SodaStream models you select. Although the brand is known for high quality manufacturing, it can be a wise long-term investment and insurance to purchase a warranty, if it’s an option. Once you have investigated if it’s available, along with how it may impact your budget, you will be ready to make a purchase that you can be confident will last for years ahead. Choosing the best SodaStream model of 2019 for your needs can be daunting as there have been many iterations over the years, with several still available for sale today. Checking out reviews and ratings, and deciding on a budget, will help you to trim down those options, cross off the weaker models, and pick the right model for you. Don’t forget to consider why you want a soda maker and what you are going to use it for, and you are sure to find the SodaStream model for your preferences. Once you’ve made your purchase, you’ll be creating fizzy beverages for your family or coworkers to enjoy for years to come. Your wallet, your waistline, and the environment, will thank you!